When a slew of microscopic, single-celled algae close a multimillion dollar crab fishery in Washington, people pay attention. Five months later, the same algae shut down crab fisheries along most of the U.S. West Coast just as UC Santa Cruz ocean scientist Raphael Kudela was about to give a briefing for the House of Representatives about this year’s unparalleled blooms of toxic ocean algae. With conditions ripe for future blooms, interest in forecasting the algae’s whereabouts had skyrocketed. 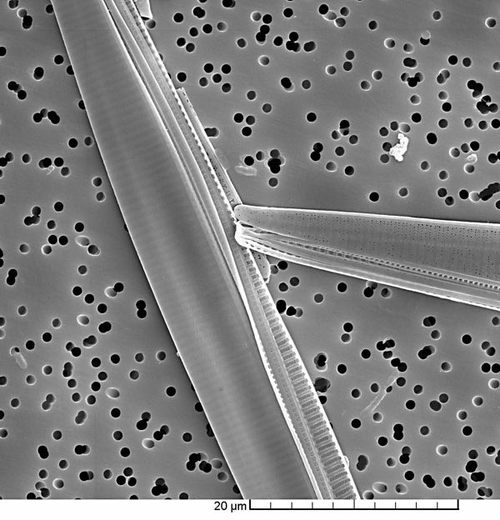 2015 was a record year for blooms of Pseudo-nitzschia, a diatom that produces the neurotoxin domoic acid. 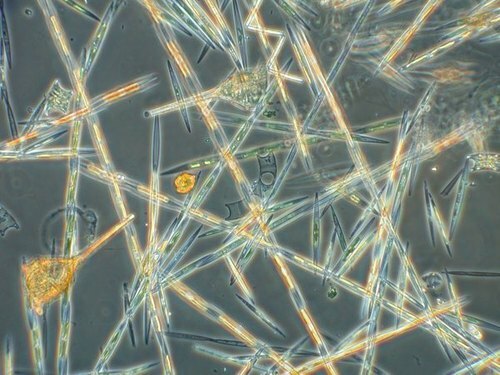 To foretell what combination of ocean conditions will lead to Pseudo-nitzschia blooms is one challenge, but predicting how much neurotoxin it will produce is another beast altogether; the levels aren’t related. Moreover, not every Pseudo-nitzschia species produces the toxin or shows up each year. UC Santa Cruz research scientist Clarissa Anderson started working on a computer model of Pseudo-nitzschia blooms and toxin production for her doctoral thesis at UC Santa Barbara, then came to UC Santa Cruz as a postdoctoral researcher in Kudela’s lab. The toxin data that Kudela has been collecting off the Santa Cruz wharf since 2002, plus historical data going back to 1991, gave them gobs of observations to improve and validate their modeling endeavors. NASA funds Anderson and Kudela’s two models that map out where the diatom is likely to be in California’s waters, as well as probable hot spots of domoic acid. In 2018, the National Weather Service and the National Ocean Service will officially incorporate the Pseudo-nitzschia forecast models into their servers and begin supporting their operation around the clock. Algal forecasts will have a human element, with experts regularly translating the meaning of the numbers, so resource managers can make decisions. Similar forecasts are available for cyanobacteria in the Great Lakes and red tides in the Gulf of Mexico. So what does it take to map blooms three days in advance? Without ocean sensors covering every square mile and relaying instantaneous readings, Pseudo-nitzschia models can’t be real-time predictors like the weather models. A combination of readings from remote systems (underwater robots and satellites), measurements of currents, and output from other forecast models of temperature and salinity all get swirled into one number-crunching machine to produce a very useful map of Pseudo-nitzschia numbers. Last summer the model forecast high toxicity off Humboldt County, which had never been a toxic hotspot. Tests confirmed the toxin’s presence, however, and it later reached record levels in razor clams (340 ppm), forcing the closure of the shellfish fishery. Ocean scientist Raphael Kudela explains the massive bloom of toxic algae that spread along the West Coast in 2015.